A needed break from meat tonight. Well kind of. The peppers were stuffed with Aborio Rice and Lentils. I had the lentils in the freezer from the last batch of lentil soup we had. I sauteed some chopped onion, zucchini and yellow squash. Seasoned the filling with the usual - salt, pepper, thyme, parsley and crushed red pepper. 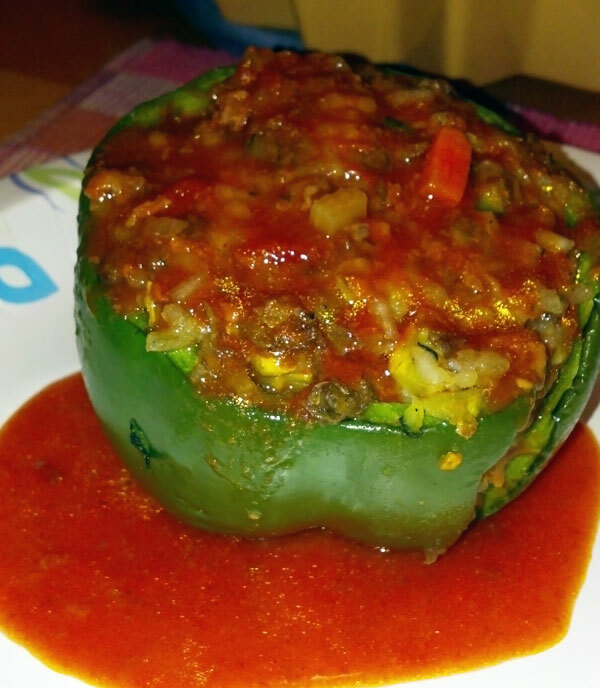 I mixed the rice, lentils and veggies, adding some Parmesan Cheese and then stuffed the peppers. Now the meat part was the sauce I used to top the peppers. It was sauce I had in the freezer from the Veal Ossobuco we had a while back. The sauce was sooooo good. Only complaint or should I say what I would do differently next time is not using green peppers. Granted they were less expensive than the red, yellow or orange, but I just really don't like the taste. Too green peppery! And I know today is the Feast of St. Joseph but I did not have a Zeppole for two reasons. First it is something I always brought over to my Dad's and it made me sad to thing of eating it without him. And secondly, I am having blood work done in the morning and that would certainly screw everything up!